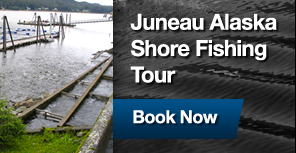 Hello, and Welcome Juneau Alaska Shore Fishing Tour, Hooked on Juneau, Whale Watch Tours. Hello and welcome to the launch of Hooked On Juneau's very own website. We are looking forward to using this space to talk more about what Hooked On Juneau has to offer as well as sharing pictures and stories from our shore based fishing tours. In the mean time please feel free to contact us if you have any questions. Based in the capital city of Alaska, Hooked On Juneau offers you a unique fishing experience. Whether you are traveling by cruise ship or have a layover in Juneau, we can show you the sights that don’t often get visited while holding a fishing rod.